The first Bone title was a competent game but was sorely lacking in several key areas. It had way too many minigames, was way too linear, and also had a very unsatisfying cliffhanger ending. For the second installment, The Great Cow Race, Telltale Games listened to both fan and critic responses and crafted a sequel that is superior to the initial installment in nearly every single way. It may not be perfect, but with a lower price and fun gameplay, adventure fans won’t want to miss this one. Things are a lot less linear this time around, and there are no minigames in sight to disrupt the flow of the gameplay. Unlike Out from Boneville which put players as a different Bone brother in each different scene, it is now possible to switch characters on the fly by selecting their icon at the top of the screen. This new element makes TGCR feel more like classic adventure games of the past, such as Day of the Tentacle. In fact, many of the puzzles will require players to make use of each of the three different characters. Puzzles don’t even have to be solved in a specific order, making the title a lot less linear than its previous installment. Graphically Telltale has taken a step forward but still has some work to do. Character models from the original game appear to have been re-used and just don’t match up to the new models. New characters are very nicely detailed and have a very striking look to them, matching the excellent backdrops. But the Bone brothers don’t have that much detail to them and unfortunately look a little out of place when compared to the rest of the aesthetics. For the next installment Telltale really needs to get everything up to the same graphical level, as it would make everything look excellent. But despite this problem, the backdrops more than make up for it. There is so much detail packed into them that gamers will want to take their time and fully explore every area, as there are plenty of things to see that aren’t directly related to the main quest. Telltale has also nailed the background music, which perfectly reflects the lighthearted nature of the game. Voice acting is solid, with excellent performances from the main characters and just above average ones from secondary characters. A lot of effort has been put into the presentation, and it helps the game stand out. The Great Cow Race starts off with a brief synopsis of the events that the first game ended with, but most people will want to have played through the first one in order to fully understand what is going on. Things still end up being fairly lighthearted compared to other adventure games (this is based on a comic series after all), but there are some more serious moments put into the mix. And while there is still a cliffhanger ending (as is to be expected from an episodic series), this one isn’t as abrupt as the ending from the previous installment. For all of the flak Out of Boneville got it had an excellent story, and this new edition is no exception. Puzzles are very easy to figure out, and generally revolve around various types of item manipulation and conversation trees. The conversation trees are more structured in this installment (when dealing with multiple characters it is easy to switch between which one you are speaking to), and when one gets stuck a handy hint system makes it possible to figure out what you are supposed to do. Rather than throwing in pointless minigames like in the last game Telltale has crafted puzzles and scenarios that better fit the confines of the game, and it makes everything a lot better. However, there is still one glaring gameplay issue that players will be faced with. Load times are unusually long between screens, to the point that some people may be annoyed. Hopefully as the franchise moves forward the developers can further optimize the engine and cut back on the load times, as they are quite noticeable. Telltale not only lowered the price point for this installment but also addressed many of the concerns people had with the gameplay. 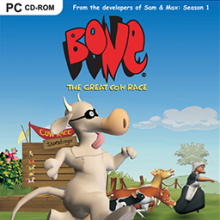 Thanks to this, The Great Cow Race feels more like a true adventure title that genre fans will easily be able to connect with. Although the load times and character models could use a bit of work, this is an excellent and inexpensive episode of a series that is steadily improving as time goes on. Adventure fans should definitely give it a shot, even if they had issues with the first one.